Bette Davis on a poster for All About Eve. Fair Use. I have to admit that I discovered this film by accident, flicking through TV channels on a rainy afternoon. But All About Eve is a fascinating film and an unusual depiction of girls and girls’ lives. Some film spoilers are ahead. It’s a black and white movie from 1950, based — though without giving screen credit — on Mary Orr’s short story The Wisdom of Eve, published in Cosmopolitan in 1946. Eve, a young and apparently devoted fan, arrives in actress Margo’s life, becomes her assistant and then her understudy, attempts to seduce her boyfriend and even takes over the lead role in her play. By the end of the story, Margo has faded out of the public eye and Eve, poised to conquer Hollywood, has won an award. In the last minutes of the film, a young fan named Phoebe arrives. The film ends on a shot of Phoebe, dressed in Eve’s robe, posing in front of Eve’s mirror with her award. It is a chilling and poignant moment, telling the audience that the cycle will not end here. I was struck by this film because it seems unusual for its time. In 1950, women in the US were, on one hand, facing pressure to return to the domestic roles they moved away from during wartime and, on the other hand, being highly sexualised in media. This decade saw films like The Seven-Year Itch and Some Like It Hot; the plots all boil down to a version, however convoluted and comic, of ‘boy meets girl.’ In All About Eve, the plot is not based on romantic relationships, but professional ones. The film focuses on the struggle for dominance between actresses, saying a lot about the fleeting nature of fame in this sector, the made-to-model way in which girls have to fit the same image of a star in order to succeed and the unhealthy, competitive behaviour between women that results from this. One recent criticism of the film is that it is pervaded by homophobia. It is a product of its time in this regard; homosexuality was criminalised in parts of the US until 2003 and in the 1950s LGBTQ people faced severe stigma. 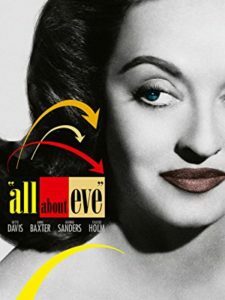 Douglas Field writes that All About Eve has two homosexual characters, Eve and Addison, who are portrayed as heartless, predatory and unfulfilled. Personally, I lean more towards the viewpoint of Kenneth Geist, who says writers have given the film more of a sexuality-based theme than it actually warrants. The film was no doubt influenced by the Motion Picture Production Code, which prohibited the portrayal of homosexuality in films. As such, the moments that can be interpreted as showing Eve’s sexuality remain subtle and ambiguous. One could as easily interpret Eve’s character as asexual — she only seems to show sexual interest in situations where it can be used to advantage for her career. The ‘sterile,’ unfulfilling lifestyle Eve seems to lead tells us more about the woman-eat-woman quest for fleeting success. These are issues that still affect girls. The entertainment industry certainly still faces deep problems in its treatment of girls and women. Meanwhile, in daily life, much of the media targeted at girls presents only one limited view of what girls should look like and how they should behave. And scrolling through social media, we can be sucked into similar patterns of comparing ourselves with other girls and feeling a need to compete. I think All About Eve makes interesting viewing for older girls because it addresses these issues in an artistic and intriguing way. All About Eve is available to watch online on Netflix and Amazon Video. A starting point for criticism of the film is Geist’s review of Stagg’s book.